Inspired by the pictures of the school children in Malawi who seem to enjoy the beads very much, and who asked for more shapes I have today worked hard sketching new designs. It is not so easy to make their visions of crocodiles or elephants come true when all I have to work with is a monochrome two-dimensional plastic surface of approximately 20x20 millimeters! Here are some of my ideas, though. Today we visited Mzuzu Academy, an internationally accredited secondary school with deep roots in the community of Mzuzu. Kate Wilson guided us around and introduced KNPO to the students. 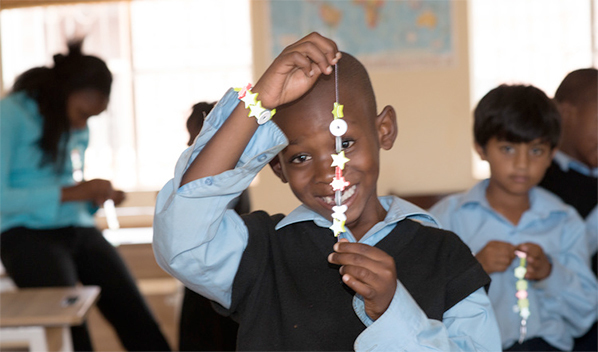 From kids to teenagers it was a success, the children loved the KNPO beads and made several bracelets for themselves, brothers and sisters, mom and pappy, girlfriends and boyfriends… it was fantastic to see their enthusiasm. One of the older ones proclaimed, “This is so cool for dancing at the disco”. The kids hoped that we would make blue beads, elephants, crocodiles, and snake beads in the future. What great ideas! Today the very fist shipment of beads arrived in a cold and grey Stockholm. The moment we opened the box the whole day brightened! This is the very first bracelet but the photo although with flash does not do it justice. The reflective surface is incredibly bright when exposed to light and the day-glow colors are really cool. We are so pleased!